Purpose: To evaluate whether 5.0 × 5.0 mm dental implants with a novel nanostructured calcium-incorporated titanium surface could be an alternative to implants of at least 10.0 mm long placed in bone augmented with bone substitutes in posterior atrophic jaws. Materials and methods: Forty patients with atrophic posterior (premolar and molar areas) mandibles with 5.0 mm to 7.0 mm bone height above the mandibular canal, and 40 patients with atrophic maxillas with 4.0 mm to 6.0 mm below the maxillary sinus, were randomised according to a parallel group design to receive between one and three 5.0 mm implants or one to three at least 10.0 mm-long implants in augmented bone at two centres. All implants had a diameter of 5.0 mm. Mandibles were vertically augmented with interpositional bovine bone blocks covered with resorbable barriers. Implants were placed after 4 months. Maxillary sinuses were augmented with particulated porcine bone via a lateral window covered with resorbable barriers, and implants were placed simultaneously. All implants were submerged and loaded after 4 months with provisional prostheses. Four months later, definitive screw-retained or provisionally cement metal-ceramic or zirconia prostheses were delivered. Patients were followed to 3 years post-loading and the outcome measures were: prosthesis and implant failures, any complication, and peri-implant marginal bone level changes. Results: Seven patients dropped out before the 3-year evaluation (two short mandibles, one short maxilla, two augmented mandibles and two augmented maxillae). In mandibles, two grafted patients were not prosthetically rehabilitated because of multiple complications and two implants failed in the same patient (the second was a replacement implant) vs one patient who lost a short implant and crown 2 years after loading. In maxillas one short implant failed with its provisional crown 3 months post-loading. There were no statistically significant differences in prostheses (difference in proportion = 0.001; 95% CI: -0.12 to 0.13; P = 1.000) and implant failures (difference in proportion = 0.00; 95% CI: -0.13 to 0.13; P = 1.000) up to 3 years after loading. Significantly, more complications occurred at mandibular grafted sites: 17 augmented patients were affected by complications vs eight patients treated with short implants in mandibles (difference in proportion = 0.43; 95% CI: 0.13 to 0.64; P = 0.008). In the maxilla, six sinus-lifted patients vs two patients treated with short implants were affected by complications; the difference not being statistically significant (difference in proportion = 0.21; 95% CI: -0.05 to 0.45; P = 0.232). Patients with mandibular short implants lost on average 1.10 mm of peri-implant bone at 3 years and patients with 10.0 mm or longer mandibular implants lost 1.39 mm. Patients with maxillary short implants lost on average 1.04 mm of peri-implant bone at 3 years and patients with 10 mm or longer maxillary implants lost 1.43 mm. Longer implants showed a greater bone loss up to 3 years after loading than short implants both in maxillae (mean difference: -0.39 mm; 95% CI: -0.70 to -0.07 mm; P = 0.017) and in mandibles (mean difference: -0.29 mm; 95% CI: -0.53 to -0.05 mm; P = 0.020). Conclusions: Three years after loading, 5.0 mm × 5.0 mm implants achieved similar results than longer implants placed in augmented bone. Short implants might be a preferable choice to bone augmentation especially in posterior mandibles since the treatment is faster, cheaper and associated with less morbidity. However, 5- to 10-year post-loading data are necessary before making reliable recommendations. Conflict-of-interest statement: MegaGen (Implant, Gyeongbuk, South Korea) partially supported this trial and donated implants and prosthetic components used in this study, whereas Tecnoss (Giaveno, Italy) donated the bone substitutes and the barriers. Data property belonged to the authors and by no means did the manufacturers interfere with the conduct of the trial or the publication of its results. Purpose: To present the medium-term results of one-stage guided bone regeneration (GBR) using autologous bone and anorganic bovine bone, placed in layers, in association with resorbable collagen membranes, for the reconstruction of horizontal bony defects. Materials and methods: This study was designed as an uncontrolled prospective study. 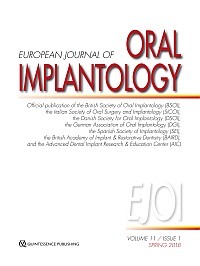 Partially edentulous patients, having less than 6.0 mm and more than 4.0 mm of residual horizontal bone width were selected and consecutively treated with simultaneously implant installation and bone regeneration by using 2.0 mm of autologous bone and 2.0 mm of anorganic bovine bone that was placed in layers and then covered with a resorbable collagen membrane. Outcome measures were: implant and prosthesis failures, any complications, peri-implant marginal bone level changes, probing pocket depth (PPD) and bleeding on probing (BOP). Results: In total, 45 consecutive patients (20 male, 25 female) with a mean age of 52.1 years each received at least one GBR procedure, with contemporary placement of 63 implants. At the 3-year follow-up examination, no patient had dropped out and no deviation from the original protocol had occurred. No implant or prosthesis failed. In six patients (13.3%) the collagen membrane was slightly exposed 1 to 2 weeks after bone reconstruction. Four of these patients were moderate smokers. Post-hoc analysis using Fisher's exact test found significant association (P = 0.0139) between a smoking habit and early membrane exposure. Mean marginal bone loss experienced between initial loading and 30 months afterwards was 0.60 ± 0.20 mm (95% CI 0.54 - 0.66). The mean BOP values measured at the definitive restoration delivery were 1.23 ± 0.93, while 2 years later they were 1.17 ± 0.78. The difference was not statistically significant (-0.06 ± 0.76; P = 0.569). The mean PPD values measured at the definitive restoration delivery were 2.62 ± 0.59 mm, while 2 years later they were 2.60 ± 0.54 mm. The difference was not statistically significant (-0.03 ± 0.62; P = 0.765). Conclusions: Within the limitations of the present study, the use of a 2.0 mm layer of particulated autologous bone on the implant threads, and a 2.0 mm layer of anorganic bovine to cover the resorbed ridge, in combination with the resorbable collagen membrane, seems to be a viable treatment option for the reconstruction of horizontal bony defects. Conflict of interest statement: This study was not supported by any company, and there are no conflicts of interest. Manor, Yifat / Garfunkel, Adi A. Purpose: To describe a rare case of odontogenic brain abscess. Materials and methods: A healthy, 35-year-old male had two dental implants placed in a simultaneously augmented maxillary sinus. One implant failed and the patient developed a maxillary sinusitis that failed to improve following antibiotic treatment at home. The neglected sinus infection led to formation of a brain abscess. The patient was hospitalised only when he had pan sinusitis with neurological signs. Symptoms were headache attacks, a subfebrile fever and a purulent secretion from the left nostril. The osteomeatal complex was blocked, the maxillary sinus was filled with pus and the Schneiderian membrane thickened. The patient was treated with intravenous antibiotic treatment. Computerised tomography (CT) and magnetic resonance imaging (MRI) scans and functional endoscopic sinus surgery (FESS), were implemented. When his conditions worsened, the patient underwent a left frontal mini craniotomy. Results: Following the craniotomy and antibiotic treatment, there was a gradual resolution and the patient was dismissed after 2 months in hospital with no neurological deficit or signs of sinusitis. Conclusions: Maxillary sinusitis following dental implant insertion and concomitant maxillary sinus elevation should be treated immediately and thoroughly since untreated sinusitis may cause life-threatening situations such as a brain abscess. In case of severe infection, clinicians should refer immediately the patient to hospital specialists. Conflict-of-interest statement: The authors have stated explicitly that there are no conflicts of interest. The manuscript was self-funded.